A week or two back, I did a reading predicting that Ms. May's chances of winning Tuesday's BREXIT vote had improved owing to the influence of financial power..... but that success was still in the 'maybe' category. That went well. Henceforth everyone should ignore everything I say, like, always. I suppose that I can take heart that it was a maybe and not a yes. Although, I've now reinterpreted the cards I drew as further negotiations. So, perhaps a positive outcome for Ms. May's deal in some form is still possible. That being said, refer to my above statement. @Wanderer & @DanielJUK , i read both of your readings & i think they reflect the absolute chaos & farce that is UK politics. Hopefully all 3 positive outcomes not only stand for movement & regeneration of the country but an overhaul of this archaic joke that is the political system. It'll be interesting to see how they play out. Quite! That bit about a conservative schism was a bit far-fetched, I thought, but apparently that is indeed one of the things May is worried about! It’s been really interesting reading your Brexit predictions. I did a reading on Brexit back in September (posted in my journal) and found it quite hard to interpret. I think because my feelings on the issue are so strong, it was tricky to see certain cards without putting a spin on them. I’m tempted to try again with Lenormand to see what will develop in the next 4-6 weeks. Hi @Flaxen ... yes i think, unless one is extremely skiiled at macrocosm readings, they are quite hard to interpret, esp as things can change in a heartbeat in politics. I predicted that T. May would be gone by the end of the month as i got the Tower in one reading for her & 10 of swords in the other. perhaps wishful thinking...but still a week to go! 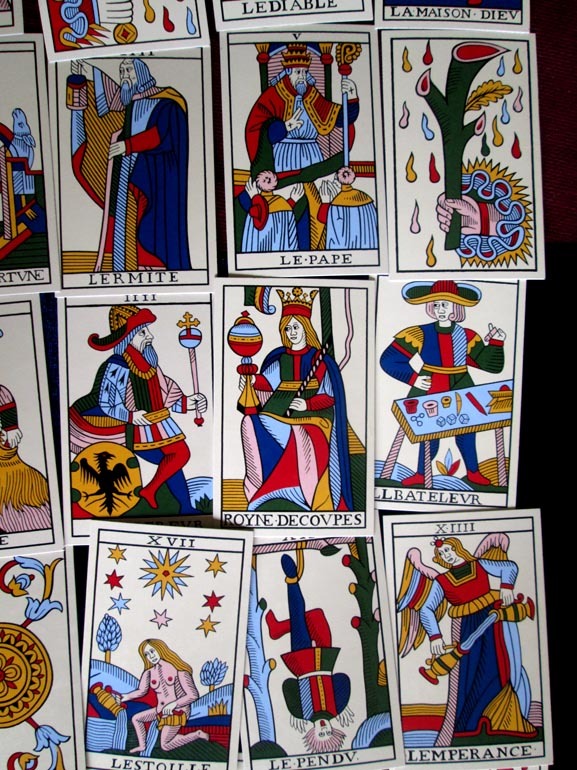 be interested to see your Lenormand reading! I’ll post it here when I do it as it would be interesting to compare it to the others. It’s a form of traditional astrology used for predicting events. It’s fascinating but takes time and I’m very out of practice. I’d love to do it though and might see if I can get a chart and work my way through slowly! The problem of reading on Brexit is that there is a lot of emotion involved and also it's so changeable. Normally you have an election or political issue to read on, it's black or white, one way or the other. There isn't really any plan here or precedent. My readings have been all over the place because it's a constantly changing issue. I am starting to get predictive readings that are going right but only when you do them on the day or 24 hours before that part of the process. I think it was Cookie who wrote earlier in the thread that they find the nearer the event you are reading on, the more accuracy. 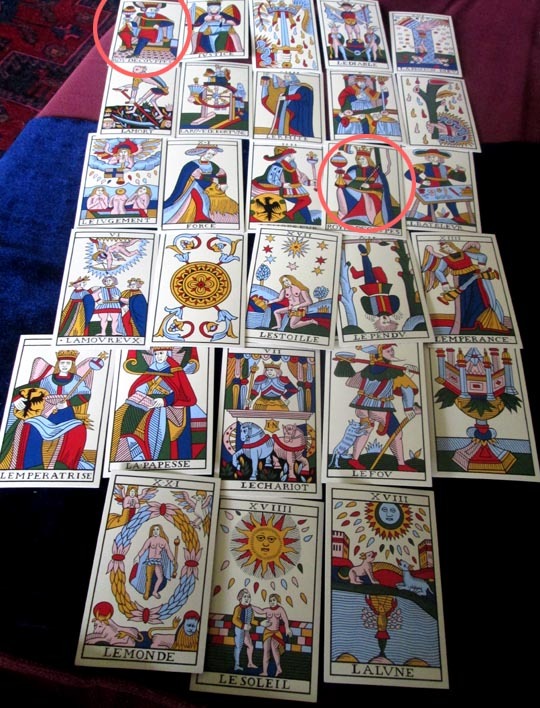 Predictive reading can also be extremely nuanced with tarot, for example getting The Tower and 10 of Swords for Theresa May doesn't mean she will be gone or ousted by current standards of politics, it's worse for her being stuck in the position she is! If things go badly, she is stuck there dealing with it and having to handle it. Getting out of the situation is the get out clause, that is why so many people have resigned or run away from it! However I am interested on reading about it and doing other world events, just to see how they turn out. I did a horary chart at the weekend which suggested that May is the pivotal person. It didn’t look promising in terms of averting no-deal but I’m going to have another look at it as I think I’ve missed some areas to examine more closely. About two weeks back, just for fun, I decided to throw an entire deck worth of cards down and pick through the chances of the UK / EU getting a deal before the March deadline in a semi-freestyle reading. I used the Noblet majors (nice and small) + the Aces and two significators. Lately I've just been using the Cup Courts as significators, and since the visible face of the EU is a man, The Queen of Cups is Ms. May and the King is the EU. I also decided to take note of where the Ace of Swords (trouble, ending, decision) and Justice (legal agreement) landed. The cards didn't reveal anything particularly new, but nailed the situation, I reckon. The King's preferred legal agreement (Justice) is in danger (Ace Swords), leading to a potential abrupt severing (Ace Swords) of ties (Devil) and a crashing out (Tower). 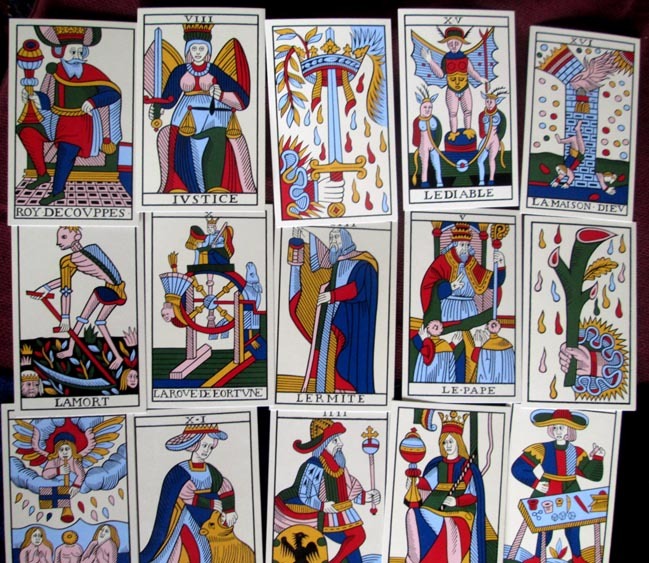 Under Justice is the Wheel of Fortune and below the Ace is the Hermit, showing going around in circles and the passage of time as being the cause of the danger. Another potential interpretation is to see the Tower as the broken houses of parliament seeing an opportunity (Ace Batons) for a spot of underhand gamesmanship (Magician). Above the Queen is the Pope (a stand-in for parliament and the speaker of the house?) and below her the Hanged Man - surely a sign of her position being constrained by parliamentary trouble. Interestingly, the Hanged Man also uncomfortably echoes the Brexiteer cry of traitor. Maybe the Magician behind the Queen's back is a sign of deceit in her approach or the deceit of her political adversaries. Still, there's not too much distance between the parties and they're facing toward each other - a positive sign. The deadline (Death), time (Wheel of Fortune / Hermit ), and parliament (Pope) being the main obstacles that need to be overcome. As the distance between the two is below the King and above the Queen, can we not infer that the EU is currently in a better position to strike a deal? And finally, the bottom three cards (World / Sun / Moon) is a sign that going out into the world without a warm relationship is a serious and troubling possibility. It was a fun reading (despite the serious subject matter). Isn't what I see and hear and smell / Just the appearance of the world in front of the world? Thanks for sharing this reading. I love the technique you used to find an answer. I also had the Hanged Man and interpreted it as ‘hands tied’ with the ‘traitor’ connotations too! I get the impression that some sort of ‘betrayal’ narrative will be spun. Possibly by that Magician - he came up in mine as someone stepping forward after the Tower moment. I saw it as representing someone used to sleight of hand who could put on a good ‘show’. Really fascinating to see these overlapping points. very interesting @devin , like your technique . Like the idea of the tower & the magician...described the state of uk politics perfectly! Yes, very interesting, thanks for sharing. I like your take on the Magician and I can think of a number of likely candidates. Actually, the situation is so chaotic, it's amazing the cards can pick anything up at all!